Most concert-goers have heard of a co-headline tour, but three headliners in one show is a fresh concept. 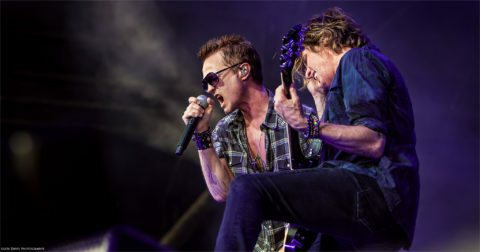 That’s exactly what Stone Temple Pilots, The Cult, and Bush have teamed up for this summer. 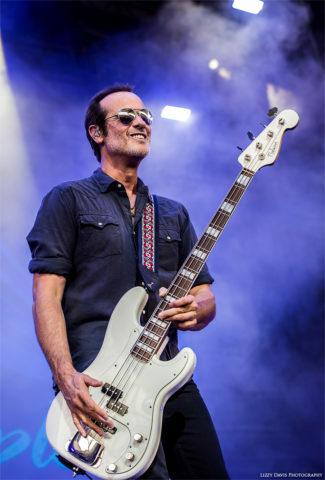 The Revolution 3 Tour features all three bands as “tri-headliners,” with the same amount of time given for each of their sets to ensure that the band (and the fans) get a full set of songs they all deserve. Doors to Tampa’s MidFlorida Credit Union Amphitheatre opened right on schedule at 5:00 PM on August 8. Patrons were still steadily trickling in when Las Vegas, NV, based opening act The Dirty Hooks took the stage at 6:30 PM. The Indie/Garage rock trio had just enough time to get things fired up with a short, bluesy, five-song set. 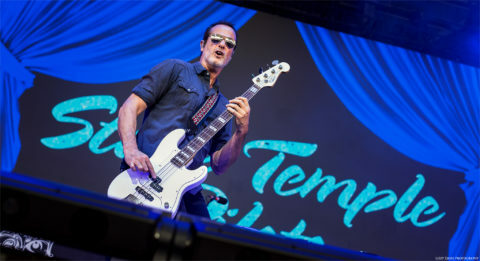 The sun was still blazing hot and Tampa gave Stone Temple Pilot brothers Dean (guitarist) and Robert (bassist)DeLeo a very warm welcome (literally and figuratively) when they walked on stage. 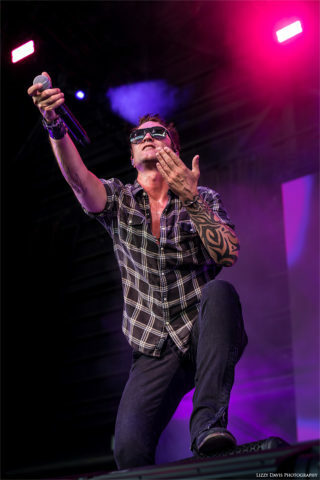 An equally warm welcome was given to the band’s latest addition, vocalist Jeff Gutt, who was hired late last year. 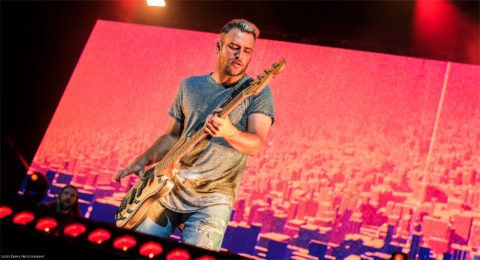 Halfway into their set, the band switched gears to play the first two singles “Meadow” and “Roll Me Under” from their recently released self-titled album, which is also Gutt’s debut album. Although those were the only two new songs played, this tour is in support of that release and there were banners with the album artwork decorating each side of the stage. On the tail end of “Roll Me Under,” Gutt jumped down from the stage and took a stroll through the general admission sections, making sure to give fans hugs, high-fives, and fist bumps along the way. 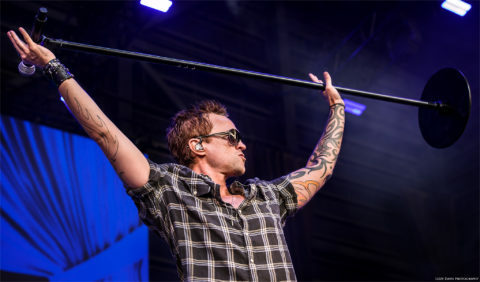 Drummer Eric Kretz stepped down from his riser at the end of Stone Temple Pilots’ set, tossing a few drum sticks into the sea of fans. Gutt took one more opportunity to say, “Tampa is awesome, we love you guys!” then joined Kretz and the DeLeo brothers took a bow and waved goodnight. 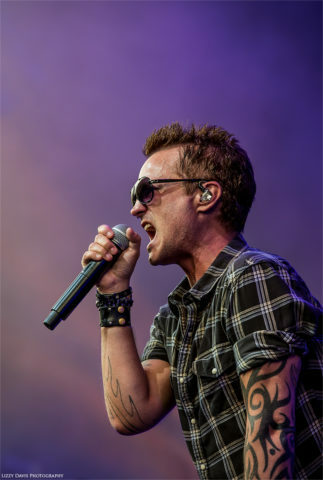 Despite their somewhat hard luck with vocalists over the past five years, the hiring of Gutt has invigorated a new life into Stone Temple Pilots and makes for one of the most uplifting and refreshing stories is recent rock music news. 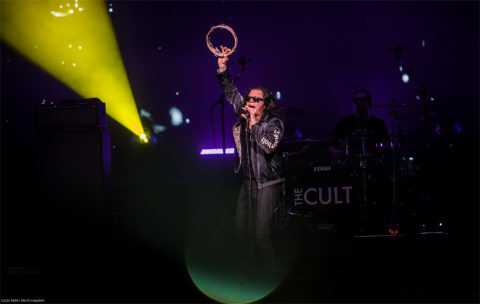 It wasn’t long before tambourine shakin’, cowboy boot-wearin’ vocalist Ian Astbury and fellow founding member guitarist Billy Duffy strutted into the spotlight with the rest of The Cult. 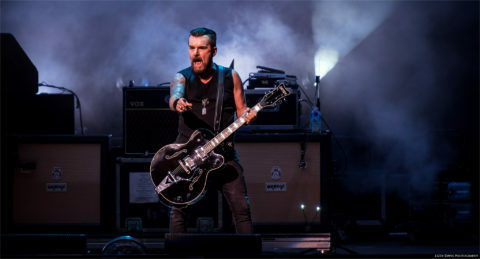 The British rockers opened their set with“Wild Flower” and followed up with “Rain” – coincidentally appropriate, as an ominous cloud had rolled in between sets. 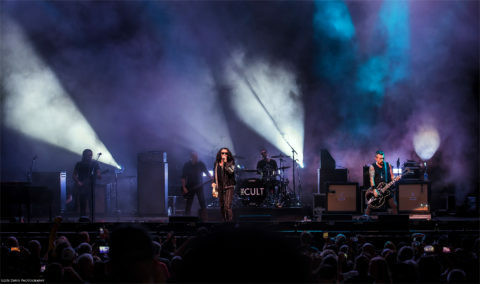 Astbury laughed as he cracked open a bottle of water and doused a few fans in the front row as if to cool them off. Right after the band broke into popular 80’s hit “She Sells Sanctuary,” the looming cloud overhead finally broke and rain drizzled into the Amphitheatre, helping cool the temperature slightly. Astbury continued to maintain a good level of crowd interaction, asking, “How ya doing fam?” As if responding to his own question, he said, “It is hot!” And even though nothing obvious seemed off, he optimistically elaborated, “We’re having all kinds of complications, but we’ll get right through it. It’s what we do.” After a moment’s pause, the band segued into “The Phoenix,” but unfortunately the complications than did reveal themselves right at the chorus of the song. Feedback from a microphone screeched through the speakers and Astbury tossed his mic to the ground in frustration. 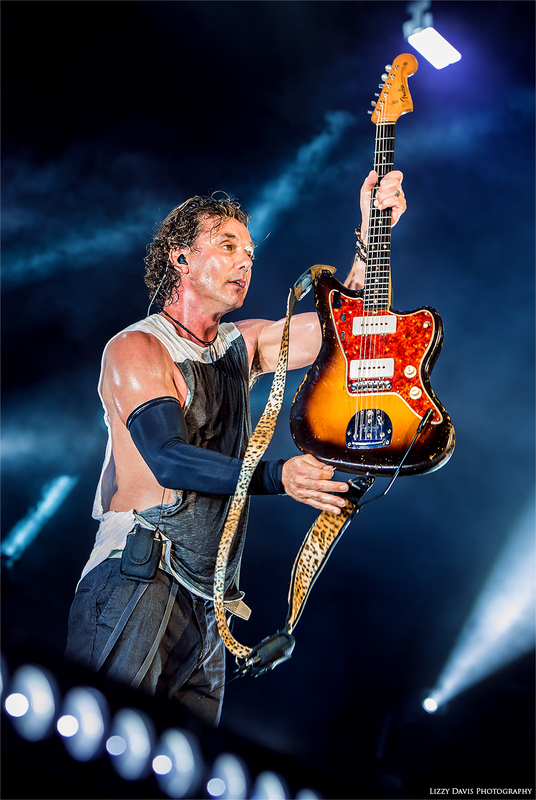 The band didn’t skip a beat, however, and Astbury picked up the next closest microphone while the crowd cheered and clapped in encouragement as he resumed the lyrics. 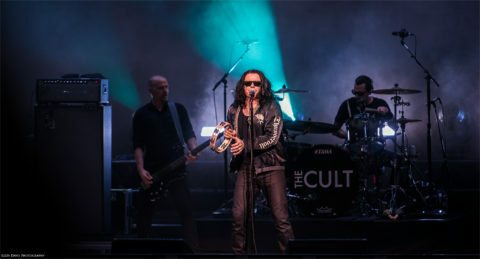 Thankfully, the remainder of The Cult’s set seemed to go without issue. 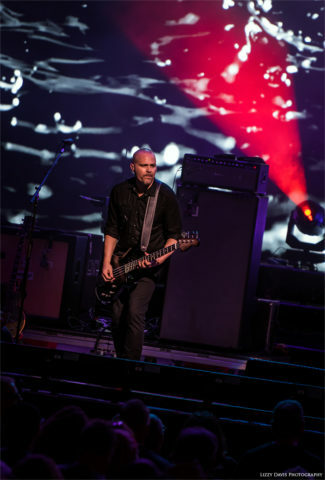 Fans were on their feet, singing along to “Fire Woman” and “Love Removal Machine.” With microphone stand raised high above his head, Astbury thanked the crowd and his bandmates, being sure to properly introduce them one by one before waving goodbye and clearing the stage for the tour’s final act. 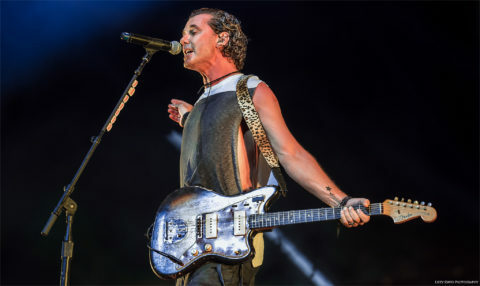 Rossdale and lead guitarist Chris Traynor were fully in synch and clearly vibing off each other as they leaned back to back and strummed through the melodies of “The Sound of Winter” with drummer Robin Goodridge playfully waving his sticks around in the background as if directing an orchestra. 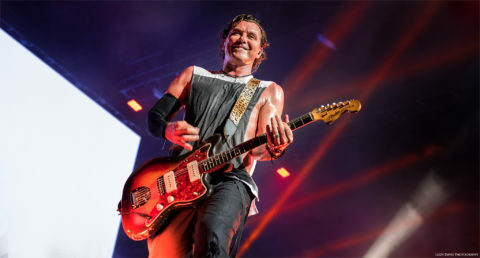 The Amphitheatre then lit up in a different way when Rossdale took center stage by himself and made a polite request in his silver-tongued British accent. “So now, what I want you to do, if you can help me out here to elevate this evening even further, even higher up into the stratosphere. Let’s take out your phones and I want you to light everyone up. Light each other up, light yourselves up, light the stage, light me, light the night.” He broke into a soul filled solo performance of “Glycerine.” The rest of Bush returned for the final chorus of the song, only to then have Rossdale abandon stage to roam through the entire venue during “Little Things.” Admirers moved like a sea of fish in waves, chasing after Rossdale’s wake as he meandered his way all the way out to the lawn section. 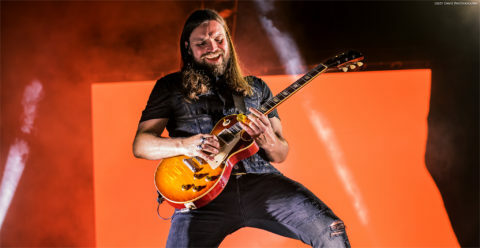 When he finally made his way around the entire Amphitheatre and got back on stage, the band broke into set closer “Comedown”. 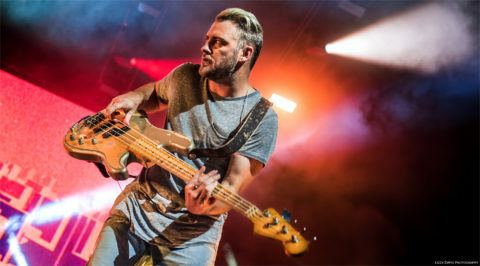 Traynor and bassist Corey Britz were interacting with the crowd, flashing expressive faces and signaling fans to make some noise. 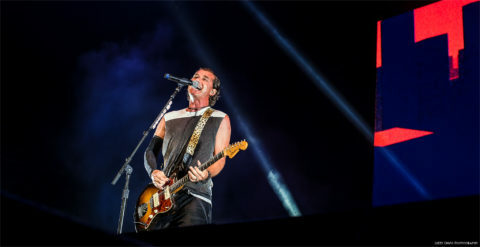 Just as the last chorus was about to drop, Rossdale backed away from the microphone and let the crowd sing instead. Smiles flashed across band member’s faces when the lyrics, “‘Cause I don’t wanna come back down from this cloud…” reverberated throughout, making it obvious they were feeling the love from the impressive sing-along. Rossdale graciously thanked everyone for coming out and for supporting Bush over the years. Before departing stage, Rossdale had one final message left to impart: “Be good to each other and be good to yourselves!” With that, the members raised their guitars and took a final bow, tossing out picks and drum sticks to a handful of lucky fans with an electronic version of “The Sound of Winter” ringing in the speakers as the crowd filtered out. 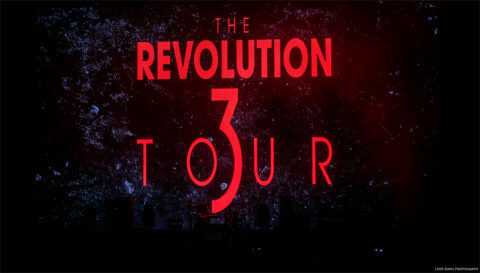 The Revolution 3 Tour began on July 18 in Nashville, TN, and will continue conquering North America until September 2, wrapping up in Phoenix, AZ. This tour guarantees a night full of top-notch performers playing the favorites from their respective discographies and is definitely worth experiencing on a date near you.